After looking through all the images that I captured at the dog track, I have to say that UrbEx is not my favorite genre of photography. Even though it provides some of the best opportunities for HDR processing, the environment itself is depressing, dark, dirty and possibly toxic. Maybe that’s why my allergies are such a mess today. But part of being a photographer is developing an “eye” to see beauty, or at least something interesting, where others see only the obvious. Take this shot of a chair, for instance. On the surface, it’s a broken, torn, rotten piece of furniture lying on a bed of broken glass and chipped floor tiles. HDR created from five bracketed photos processed in Photomatix v4. Post-processing in Paintshop Photo Pro X3, using Topaz Adjust / DeNoise. Can you see it? Can you see the beauty in the mayhem? Maybe I should go out looking for wildflowers this weekend–it might be time for a change of scenery. 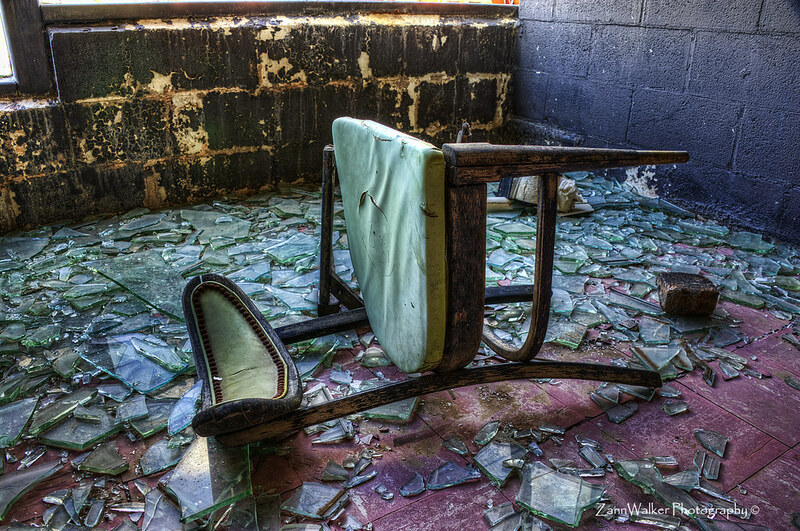 This entry was posted in Commentary, Processing, Shooting and tagged abandoned, Arizona, AZ, Black Canyon, broken, camera, chair, D700, furniture, glass, green, greyhound, HDR, Nikon, Paint Shop Pro, park, Photomatix, software, Topaz. Bookmark the permalink.